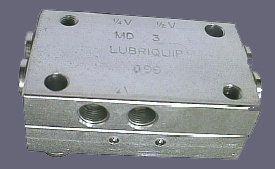 The MD divider valves are a two section block which can lubricate 2,3,4 or 6 points. The maximum pressure is 3000 PSI (207 bar). The discharge volume (MD2, MD3, and MD4 = 0.80in.³) and the (MD6 = 0.060in.³).